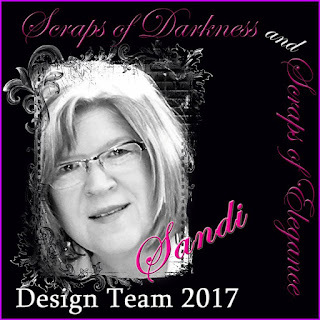 Scraps of Darkness and Scraps of Elegance: Stunning mixed media layout from Sandi! 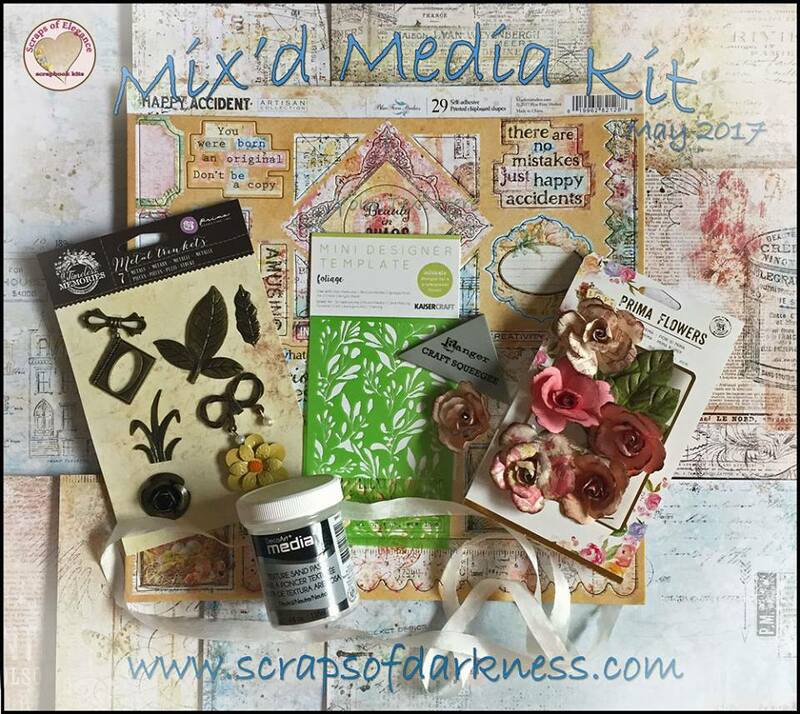 Sandi here with you today sharing another layout using the May "Mix'd Media" Kit from Scraps of Elegance Kit Club. 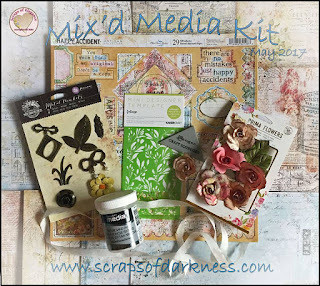 The Main Kit papers center around Blue Fern Studios Happy Accident papers and Prima Marketing Flowers plus loads of other, fun mixed media goodies to get your creative juices flowing. This little fella in my photo was actually at my house on Father's Day although the picture itself was taken last year. I'm telling you, this boy just makes my heart want to burst from joy! He is the most precious combination of sweet, obedient, funny and all-boy. And yes, I know I'm prejudiced, haha! I wish he lived closer. Anyway, I've used the Happy Accident Quirk paper as my background. After applying clear gesso using the Ranger Craft Squeegee, I used the KaiserCraft Foliage Stencil and DecoArt Sand Paste all from the Main Kit. I emphasized those areas a bit with some mist that matches with some gold tones in the paper. When that was dry, I stamped around my focal area with the Blue Halftone stamp from the Elements add-on. BTW, where has that Craft Squeegee been all my life??? It is even better than using a credit card when applying your gessoes. Love it! I painted the Arrow Word as well as as the circle frame chipboard (from my stash) with the Prima Rust Paint from the May Scraps of Darkness Creativity add-on found HERE. I also added a few none-pink flowers from the Flower add-on and tucked in a few of the ephemera from the Elements add-ons .. love, love the butterflies! You can note here that before mounting the chipboard, I tossed some black thread from my stash underneath it to mimic the upper corner design. Boy pages are hard for me, so I figured texture and insects would help me overcome! Those and a little paint! This is just a little closer-in photo to show the stencil texture and some of the stamping. And this is all across the bottom two thirds of the page. I finished with some white gesso and black mist splatters. If you've been hanging around here any length of time, you know that Melinda carries the newest products. I always look forward to getting my Kit and add-ons every month. I'll bet you would too! Gorgeous page! I love the mixed media, and the circle around your photo!